I couldn’t resist the gold packaging! I already have Red Door Red 02 and decided it would be nice to add to the collection. The best thing with gift sets from any brand is that they offer good value for money, provided you can use the products. I say that as the gift sets are put together to appeal to the majority and in the UK, black skin is not in the majority! 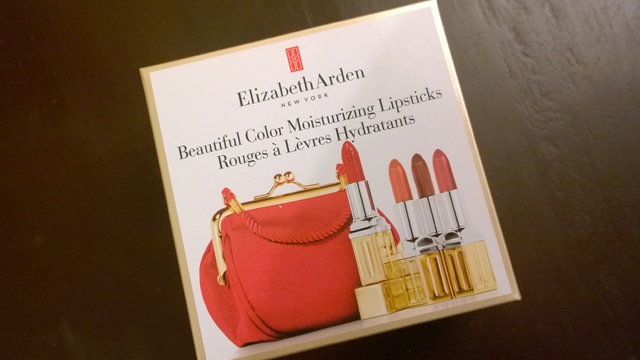 Having said that, I think I can easily wear 3 out of 4 of shades so I commend Elizabeth Arden for putting together this collection. 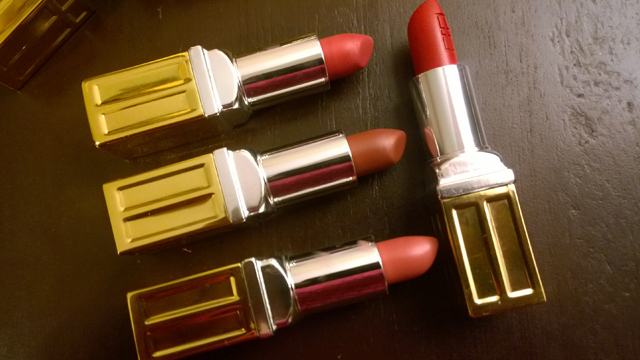 The lipsticks are of a creamy texture which gives a little shine. It also means that they don’t last as long as matte lipsticks so to extend the life of the lipstick on the lips, it’s probably best to use lip liner. I usually use lip liner however after getting such a good deal on the lipsticks, I couldn’t bring myself to spend 4 x £17 on lip liners. In the photos I have applied the lipstick straight from the bullet without lip liner. Wildberry actually comes up quite bright on me so I think it is a night-time shade for me. It is very pink so I’m not sure where the berry aspect comes in! I would like better coverage with Sweet Pink, a light pink which looks quite pale on my dark lips but not so pale in the tube. I’m sure I can achieve the opaque look I want with lip liner. With Mocha Shimmer, again I would probably prefer it with a matching lip liner but because it is the most neutral shade in the collection for me, I can do without the lip liner for a natural look. As well as being creamy, it has the tiniest hint of gold running through it to give it a metallic shine. Finally, I always wear lip liner with red lipstick otherwise it ends up all over my face and Red Door Red is no exception! It’s lovely and bold and I think I can wear it day and night. As with many premium brands, we pay for nice packaging. The gold and silver cases feel luxurious and have a nice weight to them. Plus Red Door Red has the signature red door carved into the bullet which I think is a nice touch. Overall I am pleased with my purchase. I wonder what will be in the Boxing Day sales! 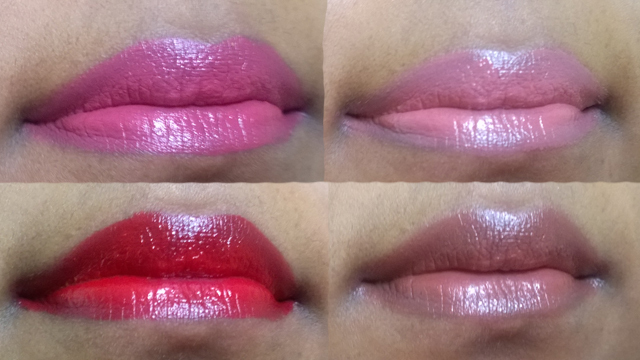 Top to bottom: WIldberry, Mocha Shimmer, Sweet Pink. I now have two Red Door Reds and I really don’t wear enough red lipstick to justify keeping both. I’m thinking about a mini giveaway – what do you think?